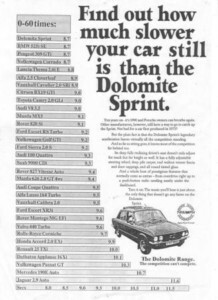 Find out how much slower your car is than the Dolomite Sprint. Find out how much slower your car still is than the Dolomite Sprint. An A4 size 12 page colour sales brochure, publication number 3230/A dated 1976. 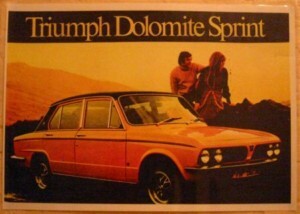 20 page brochure for the Dolomite range from 1978 including 1300/1500/1850 and the Sprint. Measures approx 60cm x 40cm – very, very 70s!! 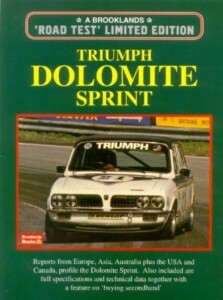 Reports from Europe, Asia, Australia plus USA and Canada, profile the Dolomite Sprint. Also included are full specifications and technical data together with a feature on ‘buying secondhand’. 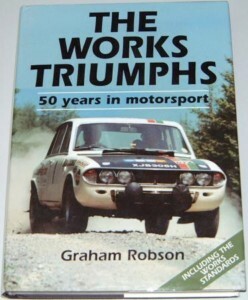 Graham Robson – Triumph co driver, team manager, organizer and world authority on all things connected with the marque – recaptures the thrills, and problems of those turbulent years, interweaving his commentary with personal interviews with the drivers, team managers and engineers who helped create the victories. The Official parts and accessories catalogue from Rimmer Brothers. Also covers TR8 and TR7 Sprint. Out of date when launched? This pioneer of sixteen-valve technology is poised for classic status. The 16 valve Dolomite Sprint’s troublesome reputation makes it an unusual car to tune. Greg Emmerson looks at an extensively modified version with a sub 6 second 0-60mph. The Dolomite Sprint may have a poor reputation but its advanced 16 valve engine offers enormous potential as Greg Emmerson discovers. Publisher : Security Publications Ltd.
Collector’s statistics and information sheet from the Hot Cars publication. Technical document detailing Modern Engine Design,Lubrication, The Oil Checklist, Development of New Oil Technology, Practical Problems and Recommendations. The official factory workshop manual for the big saloons. Covers manual and automatic version of the above vehicles. Original Handbook as sold with vehicle on the 6th November 1975. Updated and revised edition Covers all DCOE and Dellorto DHLA sidedraft carburettors. Strip & rebuild. Jetting. Choke sizes. How to get the right set up for your engine.